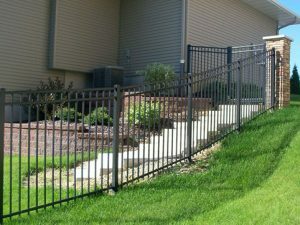 Aluminum is a beautiful fencing option. Aluminum is maintenance free and will not rust like iron or steel and is therefore an ideal material for our climate. It can minimize visual interference with its surroundings, making it a favorite around pools. Aluminum can also be dressed up to make a statement like no other material can. That makes it a favorite choice for large entrance gates. It has the flexibility to be purchased affordably or to allow a wide variety of style choices and enhancements. 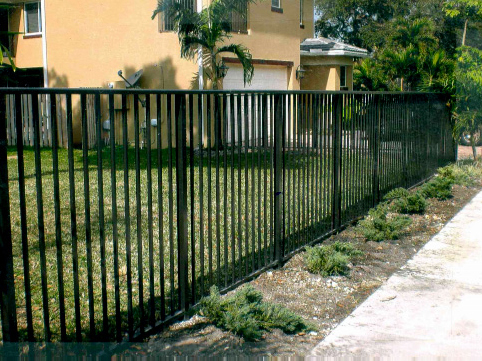 Here in South Florida, we offer two types of aluminum fences: railing and picket. Rail aluminum is a product created in South Florida and is built locally. Therefore, it can be obtained in just a few days. 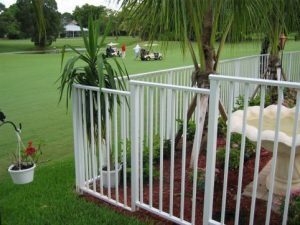 In residential fence, it offers a simple style with a larger picket than the nationally manufactured aluminum product at a reasonable price point. Picket aluminum is produced by national manufacturers and used nationwide. It offers unparalleled style choices, color choices and enhancements such as rings, finials, and ornate post caps. It is offered in residential, commercial, and industrial sizes and with smaller gaps between pickets to keep in small dogs. It can accommodate a wide variety of gate needs including large sizes, rolling gates, and can be made with arches and other enhancements. It is rackable, meaning it can go up and down terrain that is not flat without having to stair step as is the case with rail aluminum. Because of the many available choices, it will take three to four weeks to obtain this product. Must be stair stepped if the ground is not level. Has a simple style – a top and a bottom rail with pickets in between. The top rail is continuous and rounded. It looks like a mushroom when viewed from an end. Can be obtained in a few days. Is available with ¾” x ¾” and 1” x 1” pickets as well. Has a wide variety of price points. Is rackable so it can go up and down uneven ground elegantly. Has a wide variety of choices of style, color, size and enhancements. The top rail is built into each 6 foot section of fence. Will require three to four weeks to obtain. 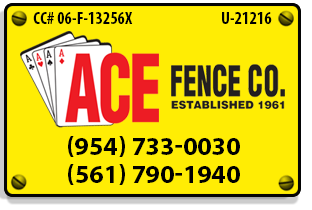 As with all of Ace’s fencing options, any Aluminum fence purchased and installed from us will meet or exceed all structural codes and wind load requirements in Broward and Palm Beach Counties. You can rest assured knowing that you’re getting an extremely durable fence that will look great for years to come.